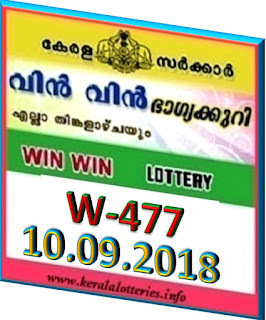 Kerala lottery result of Win Win W-477 on 10-09-2018. 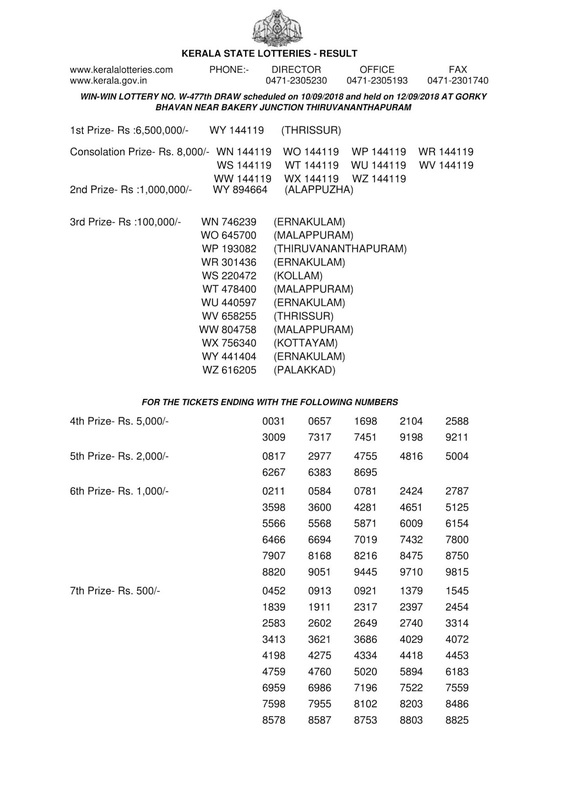 Live Kerala lottery results from 3:00 PM. 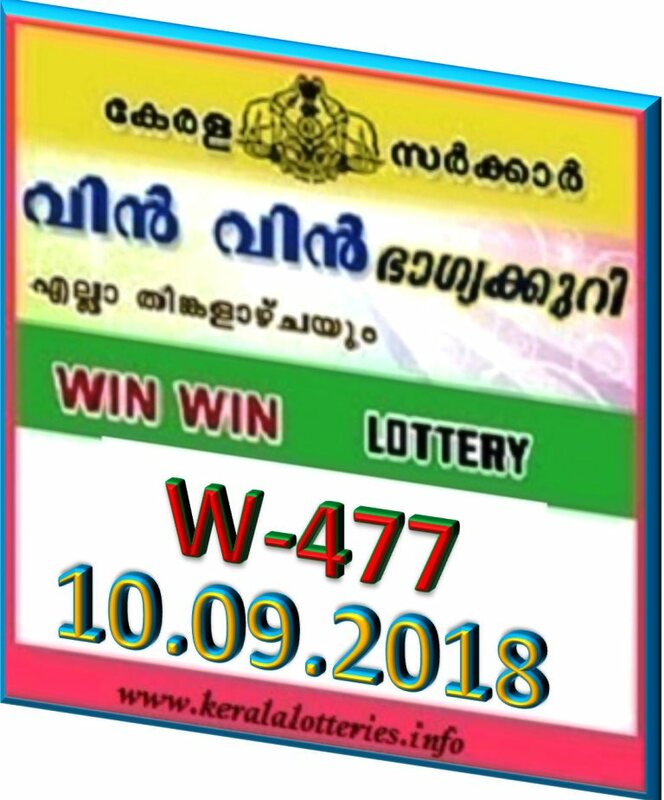 WinwinW-477 lottery result today on 10 September 2018 held at Sree Chithira Home Auditorium, Pazavangadi, East Fort, Thiruvananthapuram. One ticket of Win-Win-W-477 costs Rs.30/- and carries a first prize of Rs.65 Lakh, one second prizes of Rs.10 lakh and another twelve third prizes of Rs.1 lakh in the top slab. Winwin W-477 lottery lower tier prizes start from Rs.5000/- (4th prize) and ends in Rs.100/- (8th Prize). There are 11 consolation prizes of Rs. 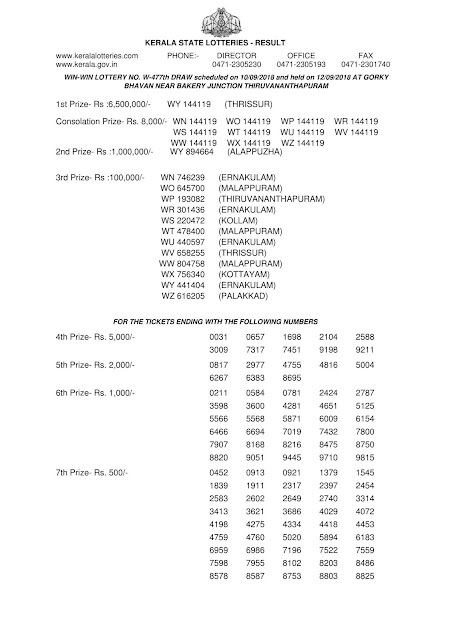 8 thousand for Win-Win (W-477) lottery.Total amount to be disbursed in the draw of Winwin-W-477 lottery on 10-09-2018 will be Rs.15,00,52,000/- through 2,20,345 prizes. W-477 WinWin lottery is printed in twelve series and drawn on every Monday. The current prize structure of Win-Win lottery is prevailing for the draw of W-477. 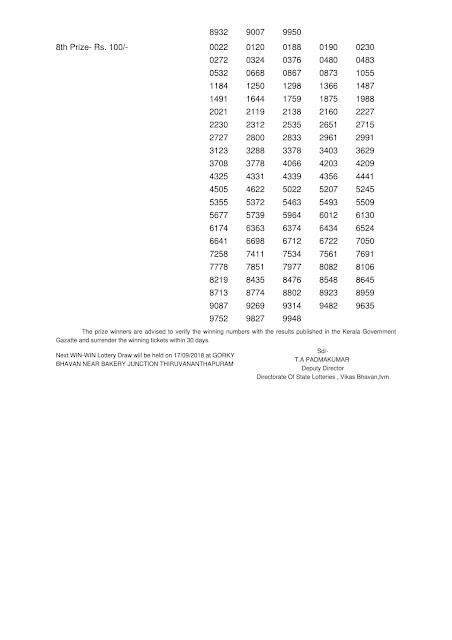 You can view the current prize structure of win-win lottery. Live Kerala lottery results from 3 PM and Official Kerala lottery results from 3:45 PM. Tomorrow on 11-09-2018 Kerala lottery "Sthree Sakthi SS-123" draw at 3:00 PM.